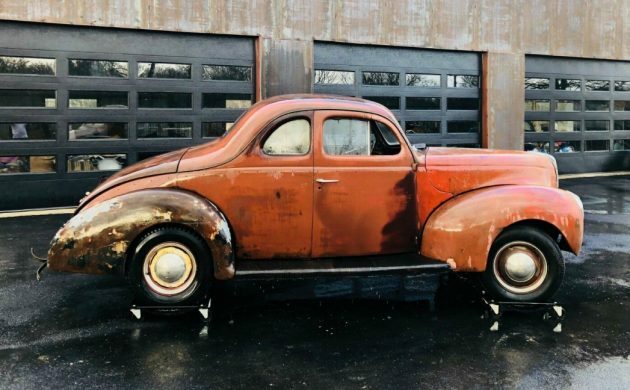 Vehicles like this 1940 Ford Standard Coupe were the mainstay of traveling businessmen and company representatives for many years. This particular car doesn’t appear to be a Business Coupe but is the regular 3-seat model. It needs a ton of work to bring it back to life in one form or another, but it is a true blank canvas for the next owner. Located in Fort Worth, Texas, it is listed for sale here on eBay. We have rust, but I think that we’ve all seen worse. The trunk floor will need to be replaced, and there is some present in the lower quarters, but this could be patched. There are a few dings and marks around the car, but the body is generally straight. A significant amount of the external trim appears to be missing, so replacement items will need to be sourced. The glass that is present looks quite good, although it appears that the quarter-vent windows in both doors are missing. There’s really not a huge amount that can be said about the interior, simply because there isn’t much there. The new owner is going to have to source a lot of parts because there is only a seat and a steering wheel there. 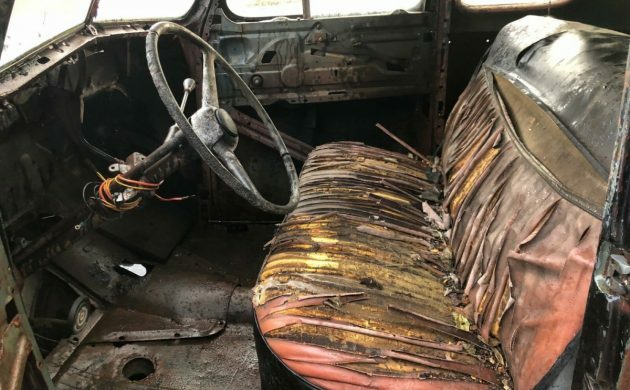 The dash is missing, so this is where I started to think of this as less of a restoration project, and more of a candidate for a custom or rat rod project. You could take the interior and do as you wish with it. After all, it’s not like you’re going to be discarding a lot of original parts. This is a photo that has me really intrigued. I expected to find either an empty engine bay or Ford’s venerable flat-head V8. What I didn’t expect to find was an OHV V6 engine. 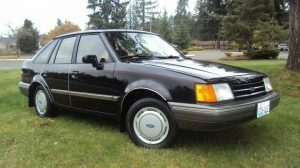 My first thought was that it was a Ford “Essex” V6, but I don’t think that it is, as the front casting on the block looks wrong. Regardless of what it is, we know that this is definitely not a numbers-matching car. That also makes me wonder what transmission is fitted to the car, as this also isn’t clear. The new owner would definitely appear to be starting from square one with the mechanical components on this car. 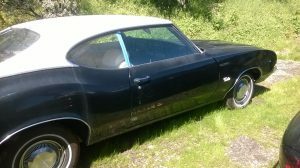 I look at this Ford Coupe and I really don’t see it as a viable restoration project, as there are so many original parts that are missing. With a complete interior required as well as an engine and transmission, it doesn’t seem to make financial sense. 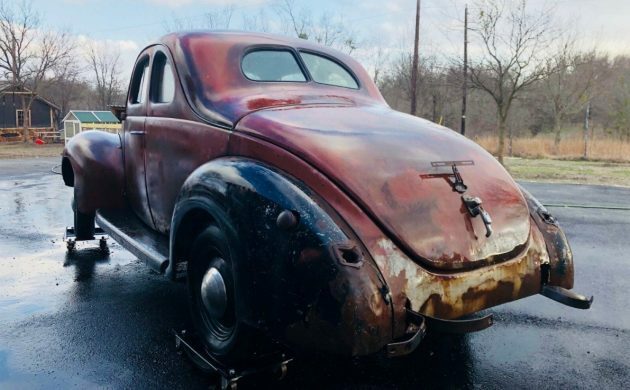 As a custom or rat rod, it makes significantly more sense, as it is a true blank canvas for either alternative. 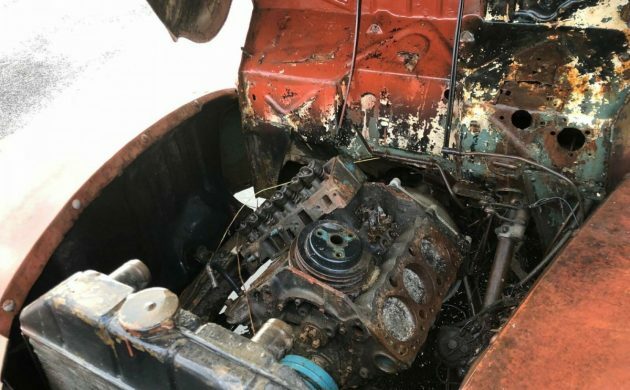 The owner has set an opening bid of $5,000 for the Ford, but the option is there with a BIN of $8,500. If you took this on, what path would you follow? Business coupe’s such as this are a wonderful concept. I wonder if this one has the slide-out pickup box in the trunk? I’m curious in finding out if there is some way to determine if and which business coupes have the slide-out tray (slide-out pickup box). This isn’t a business coupe. How can you or anyone out there determine if and which business coupes have the slide-out tray (slide-out pickup box)? Al, I don’t recall ever seeing or hearing of a Ford coupe with a slide out pu bed. I recall seeing Chevys with this feature. 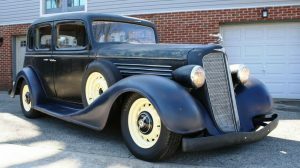 I went on Google and found that Chevy did have a coupe-pickup option from ’36-’42. Hudson had something similar. There may have been aftermarket kits available or owners who made their own. That I don’t know. I have owned my ’40 Ford Standard since 1976, I consider myself a knowledgeable owner but by no means an expert. I learn new things all the time. If you look at the pictures with it water soaked inside and out you can hear the rust grow. I’d build it as a homage car to the early stock car racing days. This car’s for me. 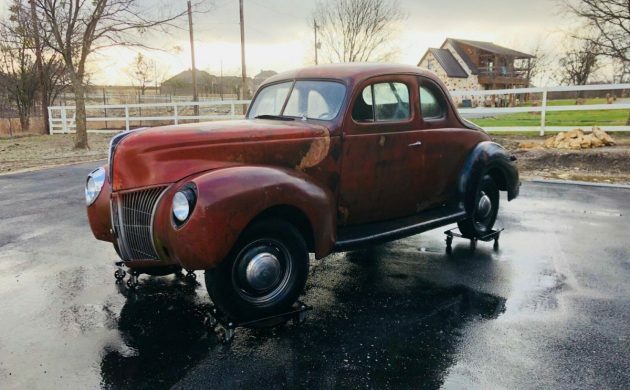 Well, I would take a project like this one on but I’ve got a ’42 in my backyard that needs as much TLC as this one does. If this one came my way, the V6 would be pitched and a flathead V8 dropped in. There are a few project cars out west so I don’t think that finding a dash would be all that difficult. I have a Std dash but it’s a far cry from what is needed. But it would work in a pinch. Better off finding a deluxe one. I’m guessing that the engine’s a Buick V6, Adam. That’s a 4.3 Chevy V6. 3/4 of a small-block V8. Look at the water pump and timing cover bosses on the front of the block. 55 chevy dash would be very traditional. This will go at the BIN price. Very desirable car. Of course 37 lights would need to be installed. I would definitely take a different path… one that leads away from what’s left of this poor thing. Yuuup, V6 Chevy head laying on top of the right bank…guessing that a Powerslide automatic is behind it. That combo didn’t do it any favors and not sure how the original flattie radiator worked out but at least the firewall isn’t all backed up. Up to $6500 so far. Someone’s gonna get a nice hot rod out of this. I wish my welding skills were up to it. Lots to do and numerous ways it could go BUT it appears to be a solid car. Disagree A.J. – although I didn’t see any rust – because I took my glasses off – I did see lot’s of holes – and what’s all that replacement metal along the the bottom body line ? Not a $5000 plus builder more like $3500 and he can still make a nice profit . To think I bought a 40 standard Opera coupe, 90% complete and original with the 2 little jump seats for $800.00 back in 1980 that was 50 times better condition than this one! It’s really something what people ask for (and others pay for) for a project nowadays! Imagine that: Bought one much cheaper 40 years ago. 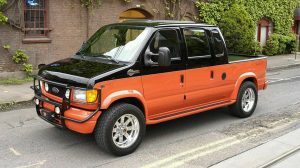 Will a Viper V10 fit in this ?